I will give Kingfisher this: her concept was original. I enjoyed how the rose played into the story, but in the end, a lot of the crowning originality of this novel played far too little too late a part in the story. I am likely overly cynical of this novel, as I would be of any Beauty and the Beast retelling since it’s my favourite fairy tale, but part of my distaste is because T. Kingfisher’s The Seventh Bride (which you can read the review for here, and look at the book’s Amazon listing here) took many fairy tale elements and yet created a whole new world and story that was completely unique, which was what I had hoped for in reading Bryony and Roses. Bryony is such a harsh name for a character most often referred to as “Belle” or “Beauty”. Throughout reading the book, I found the name rather jarring. Bryony is a wild climbing vine with green flowers, and not the most common of names. The name Bryony could be seen as foreshadowing towards both the character’s abilities and the ending, which is in a way, quite clever, but it seemed very dissonant from the tone of the novel otherwise. 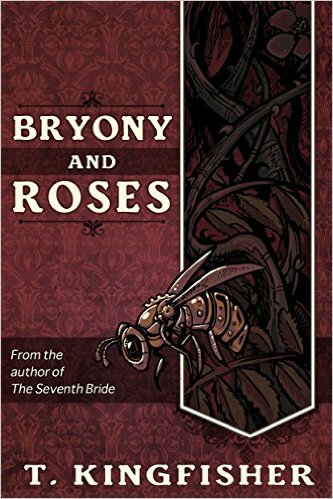 Bryony and Roses does follow closer to the original story of Beauty and the Beast than the Disney version most are familiar with. Instead of merely being an angry, irritable beast, this beast has interests and wishes to make Bryony happy, and always asks her if she’ll marry him. There is still a hint of Disney’s magic castle, but Kingfisher’s reasoning for that is quite sound, and not discovered until the end of the novel. One thing I very much liked about this version of Beauty and the Beast is that Bryony herself was the one who entered the castle and had to give herself up to the beast since she’d taken refuge there. The book does a good job of fleshing out the characteristics and personalities of Bryony’s father and two sisters (yeah, Beauty had two sisters– Disney forgot to tell you that). The personalities of the father and sisters are reversed from what they were in the original story, which made for an interesting twist. Having Bryony love and care about her sisters, and having her presence be detrimental to their well being, made more sense as to why she was so upset about having to leave the life she knew before. The true gem of this story was the function of the rose. Unfortunately, the mystery that could have and should have been building for the entire novel was quickly explained away, despite having been the whole reason behind why everything is as it is. Had more time been spent on what was only glossed over in regards to the rose, I think the quality of this novel would have greatly improved.